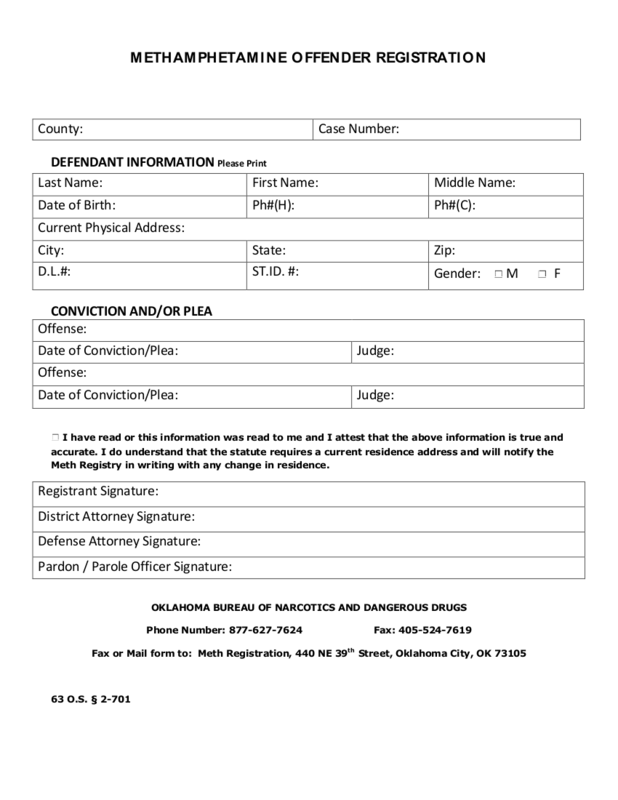 Oklahoma Methamphetamine Offender Registration Form does not notify defendants that their otherwise legal purchases would be felonies for them. 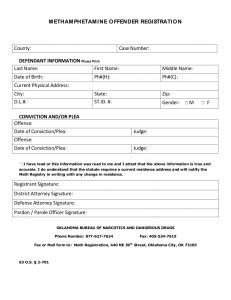 The Oklahoma Court of Criminal Appeals this week struck down portions of a law that requires people convicted of methamphetamine-related crimes to submit their names to an Oklahoma methamphetamine offender registry. The portions of the law declared unconstitutional make it a crime for those on the registry to purchase psueduephedrine, or for anyone else to assist those on the list in buying the over-the-counter drug. The case involved a Garfield County woman who had been sentenced to 14 years in prison on five counts of violating the Oklahoma Methamphetamine Offender Registry Act (63 O.S.Supp. 2010, § 2-701(B)). The woman initially pleaded guilty to the charges but then filed a motion to withdraw her plea The court denied her motion and pronounced a sentence. She appealed. In striking down portions of the meth registry law, the appeals court found that the woman had not been provided adequate notice that otherwise legal acts – purchasing psueduephedrine which can be used to manufacture methamphetamine – would be illegal for her. The decision balanced two fundamental principles of law. The state argued that ignorance of the law is no excuse for violating a law. But the U.S. Supreme Court has established precedent, based on constitutional due-process provisions, that in some circumstances require notice when otherwise lawful conduct is subject to criminal prosecution. Oklahoma’s meth registry statute “does not provide such notice, and violates the Due Process Clause,” the court wrote, citing the 14th Amendment to the U.S. Constitution. Appellate reversal of the district court’s decision brings into question an untold number of cases filed under the law that have been handed down since it took effect in November 2010. Those already convicted under the 2010 Oklahoma Methamphetamine Offender Registry Act who didn’t immediately appeal their conviction on specific constitutional grounds may or may not persuade a court to reverse those convictions. Those currently facing charges under the act, however, are more likely to find their situation drastically changed. While the decision casts doubt on cases currently pending based on Oklahoma methamphetamine registry law, it also highlights the reason careful review of a case – including review of constitutional questions in the context of current case law – is urgent before a defendant enters a plea bargain. A plea agreement might offer a sense of resolution and potentially avoid even more severe sentence, but it can also foreclose any opportunity to later appeal a case. Each case is different and it’s next to impossible to say without review how case law would apply to any new circumstance. Police conduct during investigation or arrest, prosecutors choices of which law to bring charges and legislators shortsighted efforts in drafting laws are just some of the matters that can derail an criminal prosecution. If you’ve been charged with a crime, it’s important to protect your rights as early as practicable. 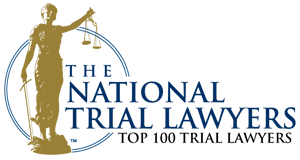 If you’ve been charged with a drug crime or any violation of Oklahoma law, whether it’s a major felony or a minor misdemeanor the criminal defense attorneys at Wirth Law Office want are available to discuss with you how you can protect your rights. 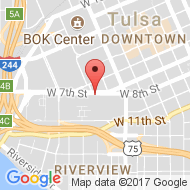 For a free, confidential consultation, contact the Wirth Law Office’s Tulsa criminal defense attorney at 918-879-1681 or toll free at 1 (888) Wirth-Law. If you prefer written correspondence, you may submit a question through the form at the top right of this page.